Owner insights on driving, performance and service by members of the BMW Car Club Of America. A valuable maintenance guide & technical reference for all BMW's. Four generations of the 3 Series, 1977-2000, 378 pages, 431 B&W photos, illustrations, and diagrams. The BMW 3 Series Enthusiast's Companion is a highly enjoyable read of the fascinating facts and trivia about the celebtrated 3er, one of the most enduring BMWs to come out of Munich. Walton writes a great historical perspective of the company and the four generations of 3 Series cars. The racing story of the 3 Series is meticulously researched and carefully written by the author of Unbeatable BMW and BMW 6 Series Enthusiast's Companion. There's also a comprehensive spotters guide and a buyer's guide that points out detailed mode-by-model information on what to watch out for when buying a used 3er. If you love the 3 Series you'll need this book. Complete coverage of the pre-war BMW 315, 319, and immortal 328, the luxury 501-503 convertibles from the early '50s, and the glamorous 507 roadster. The '70s thru the '90s had the 02 and 3 series compact convertibles, the short-lived Z1, and finally today's new Z3. 80 pgs. 60 b&w/ illus, 60 color. Softbound 81/4 x 101/4. Each book contains many photos, a 5-Star rating system, and useful tips on "problem vehicles" to avoid. Softbound, 71/2 x 91/2. Quantity Mercedes Benz by Frank Barrett. Second edition 208 pgs. Over 22o photos & illus. BMW's Z cars - both production cars and prototypes - stem from the company's Technik division which was created in the eighties to explore all the possibilities of future automotive development. The best-known Z cars are the exciting Z1, Z3 and Z8 roadsters and roadster-based coupés which allowed BMW to regain a good proportion of the international sportscar market. Cloth hardback. 250 x 207mm (portrait). 192 artpaper pages. c.150 photographs/illustrations, mainly color. Published May 2001. The definitive international history of BMW's Z-cars, production cars & prototypes, from Z1 to Z22. Coverage includes M Roadster & M Coupé. Advice on buying your own Z car. The Z3 in motorsport. Appendices detail production & sales figures, vehicle identificaton numbers and performance data. High quality artpaper production, heavily illustrated with color throughout. advises how to renovate chassis and bodywork, mechanical and electrical components; what to look for when buying a 911; and what modifications are possible. It also lists changes in production details up to 1983. A great reference book for the 1st and 2nd generation of 3 series including the M3. All the M cars from the M1 to the latest M5 are featured in color profiles and detailed histories of their development and racing exploits. Specifications, driving impressions, and races, from Le Mans in the '30s to the F1 cars of the '80s. A full history from design to factory to the track, including a look at the company before the M1 launch in 1970. Hdbd. 190 pgs., 10 line dwngs., 50 b&w, 100 color illus. Sub-titled: A Comprehensive Guide to the Classic Sporting Saloon. The brain child of Max Hoffman, the BMW 2002 took the motoring world by storm on its announcement in 1968, offering affordable high performance in an agile package. appealing qualities that continue to endear them to enthusiasts everywhere. A valuable 2002 reference. Hdbd., 6 x 81/4, 176 pgs. The Brooklands collection of reprinted articles from top contemporary automotive magazines; Road & Track, Motor, Car & Driver, and others. This collection of road tests, new model introductions, specifications, and comparisons provides a wealth of data on all the BMW M-models. Sftbnd., 8 x 10 3/4, 140 pgs., 180 b&w illus. Forget the weight bias. Elford explains techniques never before explained in any other driving book. Packed with photos, diagrams, and personal recommendations, this guide offers the special skills required to master your rear-engined Porsche. Covers cornering, balance, acceleration, gear changing, braking, and competition driving. Learn from a master, and enjoy the drive! Sftbnd., 8 1/4 x 10 5/8, 160 pgs., 189 b&w illus. 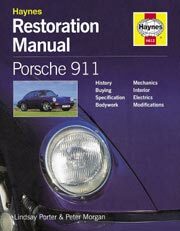 How to choose, install, tune and maintain performance equipment for your 911 - all models, 1965 on, including Turbo, special race and 'wish program' cars. A book chock full of pictures, ilustrations and tables. Sftbnd., 8 1/2 x 11, 254 pgs.